The Belleek Claddagh ring dish is further enhanced with embossed Celtic knots, a shamrock and gold accenting. Sorry, this Belleek ring holder is now retired. Features Belleek's Hand Painted Shamrock. This Belleek ring dish features the Irish Claddagh design along with Celtic knots, a hand painted green shamrock and gold accenting. The Belleek ring holder measures 2" tall x 4 1/2" wide and is gift boxed with the Claddagh legend and the Celtic knot and the shamrock histories. 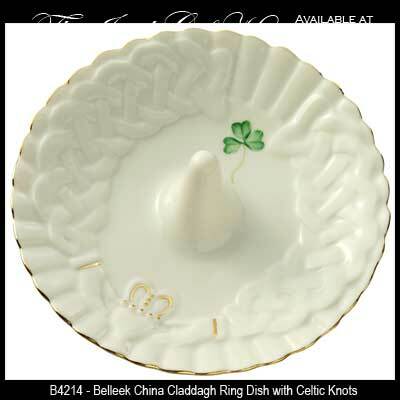 This Irish ring dish is hand crafted in Belleek, Ireland.